I the past, I have recounted my adventures en femme in sequential order, telling you what happened each day and night as it occurred. This time, I will try something different and describe a variety of vignettes in random order. When I am en femme, I always use the women's restroom and that's what I did at Hamvention. Even though the women's restrooms at Hamvention are usually deserted (because only about 15% of the attendees are female), I don't dilly-dally. I do what I have to do in the stall, then I wash my hands and fix my hair and/or makeup if needed. I was in the restroom touching up my makeup Saturday afternoon when a woman entered and struck up a conversation with me... mostly about the weather, which was hot and humid. Our conversation ended when she realized that she needed to use the facilities and excused herself to enter a stall. If that wasn't admittance to the girl's club, I don't know what is! Staffing the booth at Hamvention, I got a taste of the prejudices that professional woman face every day. Approximately 15% of the US ham population are female and the attendees at Hamvention reflected that statistic. By far, the males outnumbered females. The people staffing the booths at Hamvention also reflected that statistic. Some booths have no females, some of the bigger booths have one or two females, and a few booths have a bevy of women, but they are professional "booth babes" hired to attract customers. Some of the visitors to our booth must have read me as the equivalent of a booth babe. On a few occasions, fellows approached me at the booth and asked, "Do you know anything?" or some such. Damn! I probably know more about ham radio than they do. I was so taken aback by the question that I did not have a quick comeback. Instead, I did my duty and politely answered their questions. One fellow, who was staffing another booth nearby visited our booth Saturday afternoon to get better acquainted. He was interested in going out with me, but then he noticed my wedding ring, asked about it and then backed off when I explained that I was happily married. I often get a "taste of the prejudices that woman face every day", it's just one part of my choosing to be a woman. Perhaps I missed my calling, I should've applied as a "booth babe"! 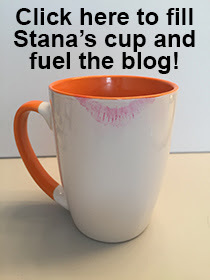 Keep writing, Stana, I'll keep reading, and thanks for being such a good ambassador and all you do for all of us! I cannot imagine any transwoman not being a feminist, Billie. I do like that dress, we are in a privileged position to be able to appreciate both sides of the gender divide , I think that is why we so often find ourselves to be feminists. After all not many get to know first hand both the confidence and assurance of the male and the vulnerability and contempt facing women. Like I said to Billie, I cannot imagine any transwoman not being a feminist. I think one of the most important facts overlooked in our culture is "aura" over looks. I have already stated you are gorgeous...but more importantly you are "good people" which women of course can detect much easier than men. You just projected a true joy of who you are...finally. With all the respect in the world I say "passing" is a cross dressing term and "being" is a transgender term. You were "being" not passing! With me, I just look at the process as how I prefer to project the inner me to the outside world. On the other hand, a cross dresser is projecting his outer self...that's all good too...and so are you!!! Thank you for the very kind words, Cyrsti!!! There is a reason I got a big (fake) diamond engagement ring and matching wedding ring. I have been followed by a few men and I trust the ring is partially why they left me alone. I've been to shows like Comdex. If an older woman, or a conservatively dressed woman is (wo)manning the booth, she probably is familiar with product. If it's a younger cutie, she probably doesn't. Not stereotyping ~ this is my experience. I've also noticed at auto shows, even though it's the same dynamic, most of the booth babes know the cars. Guys came up and saw "eye candy" and made the logical assumption. Be proud! You're in. I like how you think, Meg! Like you I'm sure, I have little problem using the ladies room It' a matter of poise and self confidence,few woman really have disagreement with someone who knows who they are. Really enjoying reading about your Hamvention experiences, Stana, and that's a lovely dress -- great print! Would you mind mentioning at some point what ham radio operators actually DO in this age of the text message? -- or don't I understand what ham radio is; perhaps I don't! What a really beautiful dress by the way.